This month's edition of The Session is hosted right here at Musings Over a Pint. You can read the original announcement here. This month we return to the Session roots and discuss a specific beer. I chose the theme "A Tripel for Two". What Tripel would you pick to share with that good friend, family member, or lover? I noted that there are bonus points for including comments from the person with whom you share the tripel. I'm looking forward to reading the contributions. I selected The Brewer's Art Green Peppercorn Tripel for this Session. I reviewed Green Peppercorn Tripel back in November 2007 when The Brewer's Art first bottled it. In the past few weeks another batch of this beer was released by the Baltimore brewery. However, I still had a bottle from 2007 stored away and decided now was a good time to open it. So Colleen and I settled down on a recent evening to see how the beer had held up. But before we could do that, I needed to get the cork out of the bottle. This puppy was in there to stay. After several minutes of twisting and rocking, it was apparent the cork was giving no quarter. I finally resorted to a corkscrew. An easy pour produced two thistle glasses full of frothy white foam. Several incremental pours later, we sat down to enjoy the fruits of the opening struggle. Green Peppercorn Tripel exhibits a bright straw color. It's an active beer with copious bubbles continually rising from the bottom. The beer has a mild yeasty aroma with just a hint of fruit. The flavor is very crisp, with a mild spiciness. As the beer warms some citrus hops come out. The finish is dry, and the yeast and spice notes leave a lingering presence. There's no overpowering flavors in this, just a nice easy drinking, and refreshing, beer. We enjoyed this Tripel in front of a fire, but it would be excellent on a warm summer evening too. If I have the opportunity to pick up any of this year's release, I'll definitely put a bottle or two away for 2010. When we decided to have our shared tripel experience for this month's Session, I was glad to share a beer with David. However, when he selected the Green Peppercorn Tripel, I felt a small twinge of concern. When we had it right after we got it a couple of years ago, I recall it as having a bit too much of a bite. Thankfully, as with many of life's finest things, it has aged well. I was very pleased with its matured flavor. It has a lovely clear golden color ~ almost like a bright apple cider. It pours with a large billowy head, very soft through which to drink. The carbonation is lively and continues well through the whole drinking experience. There is a nice spicy smell and taste. I detected some pleasant yeast fragrance and flavor which complimented the spice nicely. I was not able to detect a hard alcohol bite, however, it comes in at 9.2% ABV. It was a pleasant end to a hectic day. Now I wish we had another aged Green Peppercorn Tripel to enjoy on another cool evening. Perhaps we can stock up a few bottles for a few years down the road. 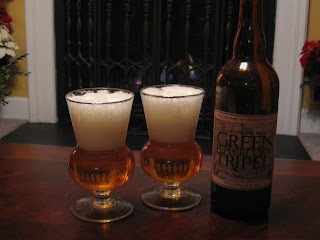 It was fun to share the aged Green Peppercorn Tripel, and the review, with my wife. We share many good beers, so maybe there are more joint posts in our future! By the way, there's more to this Session that just blog posts! Even if you are not a beer blogger, you can contribute to this edition of The Session. Alan at A Good Beer Blog has suggested an alternative way to join in the fun of The Session. Bloggers and non-bloggers alike can participate "live" via Twitter. See Alan's detailed directions for participating. Prior plans won't allow me to participate in the live Twitter tasting, but I'll be sure to check out the entries later. You can follow today's Session-related Twitter posts here. Bloggers, you can leave a link to your blog posts in the comments below or send an email letting me know. I'll post a summary after the weekend. Cheers! Update, February 9: I've posted the roundup off all the Session contributions here. My choice of tripel and my thoughts on brewing in this style next week. My post here. No Twitter for me this time. Not sure if the last comment went through or not. My first Session and it's been a blast! Here you go, David. Hope the woods aren't frozen down there. Better late then never: Yours For Good Fermentables.com. I just posted this calendar of events for Shooting Creek Brewery. More entries to follow. Cheers!